How’d Those Cars Get There, Daddy? “Mr. Marsh will see you now,” said the pink-haired secretary. I stood first. Hudson took his time, looking particularly hippie-ish amidst all the Texas décor, his tie-dye shirt loose over his belt, long hair over his shoulders. Chip looked ok—a little spaced out from the joint we’d blown in the parking lot, but about as normal as he could manage. I had my hair pulled back in a ponytail to look more or less straight-laced, at least from the front. Chip carried the folder with the concept sketches, hours of work cutting Cadillacs from magazines and pasting them in. 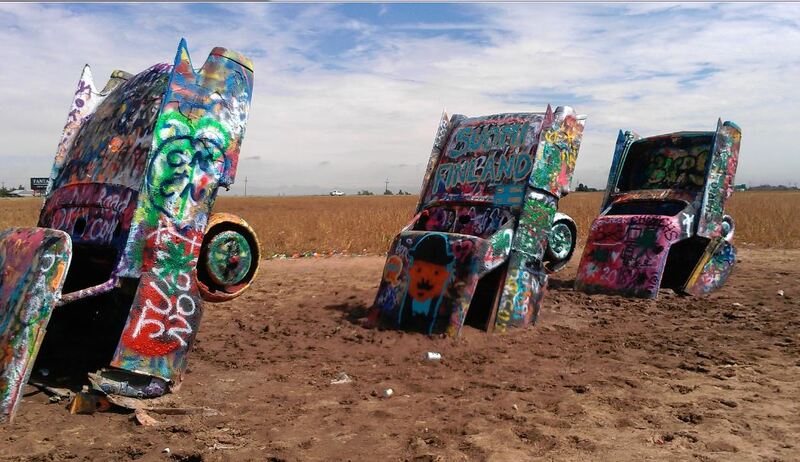 Located just west of Amarillo on the south side of Interstate 40, Cadillac Ranch originally wasn’t planned as an everlasting tribute to the tail fin. When the 10 vintage Cadillacs were entombed in concrete – nose first at the same angle as Egypt’s Great Pyramid – Marsh envisioned a temporary gag of sorts. Posted in Friday Fictioneers. Bookmark the permalink. Love the history in your piece. I knew it was in Amarillo but I love knowing more about the artist behind the art. Well done. Enjoyed the story, loved the explanation. So that’s the history behing the picture. Nice one. Ah, nice piece of history. Thanks. Aha! More of the background of the picture comes out :) Nice one! Thanks for the history bit as well as the story. Is the piece still maintained? It looks to be in pretty good condition? Loved the story, appreciated the story behind it! Great stuff. Art comes in all forms. Mmmm! Thanks for the backstory, and the fictional version too. I’ve never heard of Cadillac Ranch, but now I kind of want to go! Did my research too. Great story, the real one and yours – well imagined! A story on the story behind the prompt, heck why not? This is great, I’d want to visit one day, too. Great story! And I loved learning the history of it.